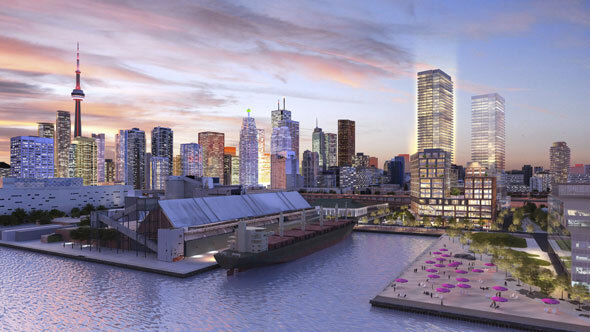 The old Guvernment and Kool Haus site on Queens Quay East is going to become a $700 million "city of the arts" by 2018, developers say. 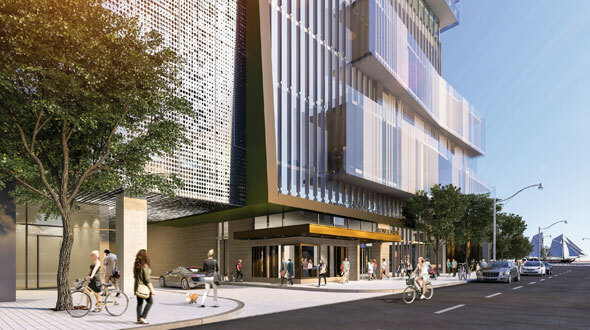 Daniels Corp., the company behind the TIFF Bell Lightbox and Daniels Spectrum in Regent Park, hopes the "Daniels Waterfront" will be an incubator for start-up businesses and artists, as well as a desirable place to live. Announced this morning, the project will include 60,400 square metres of residential space, 26,000 sq. m. of office space, 25,000 sq. 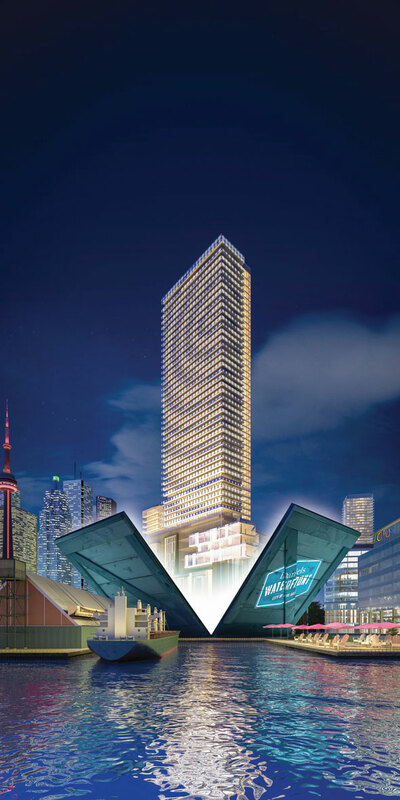 m. of retail on the site bounded by Queens Quay, Richardson, Jarvis, and Lake Shore Blvd. E. It will also include educational space for George Brown, OCAD U, and other arts-related organizations, including Artscape. 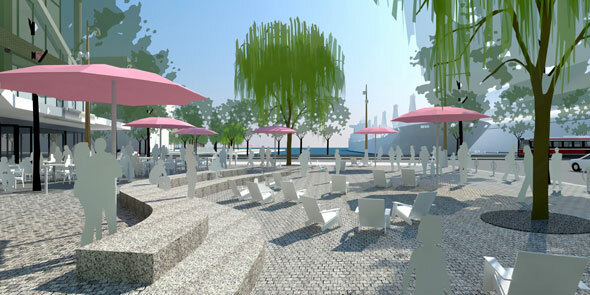 For non-residents, Sugar Beach North, an extension of the existing waterfront park with its neon pink umbrellas, will be built on the north side of Queens Quay, opposite the Redpath sugar refinery. A second public space, called "The Yard" (above) will run east to west through the site. 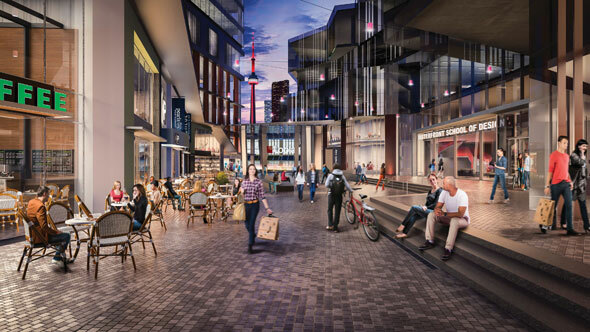 Ken Greenberg, the former director of urban design and architecture for the City of Toronto, hopes it will be like London's Brick Lane, presumably minus the graffiti. In a rare appearance at a development unveiling, Mayor John Tory, fresh from his music industry trip to Austin, praised the design of Daniels Waterfront for meeting the city's plan for the neighbourhood, but said it wouldn't get special treatment at city hall. "It is going to take precisely this kind of mixing together of the creative arts and of development, of education, of places to live, and places to work in one place to keep the city great," he said. "It is going to send a message to the rest of the world about what Toronto is." 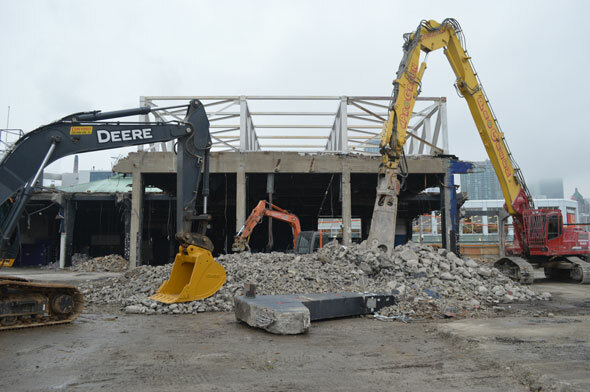 Guvernment and Kool Haus closed for good in January, paving the way for construction on the now-prime waterfront site. Daniels expects the project to be complete by the Spring of 2018. The view of the Phase One--commercial, creative, and retail space--from Jarvis St.
Kool Haus and Guvernment site today.